The South Pacific island nation of Fiji is not only an inviting and beautiful vacation destination, but its islands are home to scenic wonders, both natural and man-made, and are the cradle of ancient myths and legends as well as modern political sagas. Fiji consists of 333 islands, about 110 of which are inhabited. The two major islands, Viti Levu and Vanua Levu, account for 87% of the population of almost 883,000. The capital, Suva on Viti Levu, serves as Fiji's principal port. About three-quarters of Fijians live on Viti Levu's coasts, either in Suva or in smaller urban centers like Nadi (tourism) or Lautoka (sugar cane industry). Fiji's total land mass is slightly smaller than the state of New Jersey. Fiji's waters are home to over 1,500 species of sea life. Fiji's highest point is Mt Tomanivi at 4,344 feet. 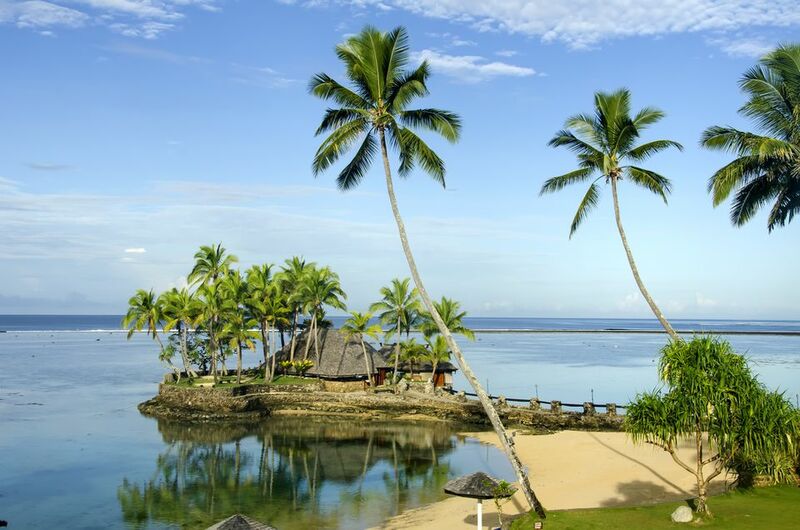 Fiji receives between 400,000 and 500,000 tourists annually. English is Fiji's official language (although Fijian is also spoken). The literacy rate among adults is almost 94 percent. According to ancient Fijian mythology, Fiji's history began in 1500 BC when giant war canoes arrived from Taganika north of Egypt, carrying Chief Lutunasobasoba and special cargo: treasures from the Temple of King Soloman in Judah, including special box called the "Kato," meaning case, and "Mana," meaning Magic, which in Fijian translates to "Box of Blessings." When the box toppled into the sea in the Mamanuca Islands, Lutunasobasoba gave the command not to retrieve it, but his General Degei returned at a later date and tried. He only succeeded in getting a big diamond that was outside the box and was immediately cursed and transformed into a snake with a diamond on his head for all eternity and is trapped in an ocean cave in Sawa-i-lau in the Yasawas. Fijians believe the box is still buried today in the waters between Likuliku and Mana and has brought great blessings to the area's villages. In 1643, Dutchman Abel Tasman, known for his explorations in what is now Australia and New Zealand, sighted Vanua Levu, Fiji's second largest island, but he did not land. In 1789, after being set adrift from Tahiti by the mutineers on his HMS Bounty, Captain William Bligh and 18 other men were chased by Fijian war canoes through what is now called Bligh Water. They paddled their 22-foot-long open boat hard and escaped, making it to Timor. About 57 percent of Fiji's population is native Melanesian or Melanesia/Polynesian mix, while 37 percent is descended from indentured Indians brought to the islands in the late 19th century by the British to work the sugar cane plantations. Fiji was a British colony from 1874 to 1970. Fiji became independent on 10 October 1970 and is a member of the British Commonwealth of Nations. The flag of Fiji consists of the British The Union Jack (upper left), which is representative of the country's long association with Great Britain. The flag's blue field is symbolic of the surrounding Pacific Ocean. The coat of arms displays a golden British lion holding a cocoa pod, as well as panels displaying a palm tree, sugar cane, bananas, and dove of peace. Fiji's main religion is Christian, followed by Hindu and Roman Catholic. The largest Hindu temple in Fiji is the colorful Sri Siva Subramaniya Temple, one of the major landmarks in Nadi. Fiji's democratic rule has been tested several times over the past four decades by military and civilian coups. The first two military coups occurred in 1987 over concerns that the government was being dominated by the Indian community. A civilian coup occurred in May 2000, followed by the democratic election of Prime Minister Laisenia Qarase, who was re-elected in May 2006. Qarase was forced out in December 2006 in a military coup led by Commodore Voreqe Bainimarama, who subsequently became the interim prime minister. However, Bainimarama has refused to hold democratic elections.